Mention the name Christian to American hockey followers and there is instantaneous recognition. After leading his Warroad high school team to the state tournament finals in 1953, Billy Christian played one year at the University of Minnesota under Coach John Mariucci before joining the 1958 United States National Team—the first American team to ever play in the Soviet Union. Bill was the team’s leading scorer with seven goals and five assists as the squad finished with a respectable 3-3-1 record in the World Tournament at Oslo, Norway. That would mark the first of five National/Olympic teams on which Christian participated, with the others coming in 1960, 1962, 1964 and 1965. But, it is, of course, 1960 that is best remembered, as Billy helped to guide the fabled squad to the gold medal by scoring the tying and game-winning goals against the Russians—the latter coming on an assist from his brother, Roger. Christian later played for his hometown Warroad Lakers for 23 years before finally retiring after the 1980 season. The team never had a losing season during this period and won Canadian Intermediate title in both 1964 and 1974. In both 1969 and 1970, Bill was the All Star coach, as the Lakers were Manitoba Senior Hockey League champions. With the Lakers, he had the good fortune to play with both his sons, Eddie and David. Both sons played college hockey with David going on to a professional career in the NHL. In 1964, with other family members, he helped found Christian Brothers, Inc., which was a multi-million dollar hockey stick and equipment manufacturing company. He continued his work for hockey through community service—which he had done on and off at youth levels for several decades in Warroad. When the Wirtz family purchased the Chicago Blackhawks in 1954, they became part of the team with a unique American heritage in professional hockey. The 1938 edition of the club won the Stanley Cup and produced six members of the United States Hockey Hall of Fame (USHHF): Mike Karakas, Cully Dahlstrom, Doc Romnes, Virgil Johnson, Vic Heyliger, and Coach Bill Stewart. Bill assumed that proud tradition when he became team president in 1967, taking over this active role from his father Arthur, who went on to become Chairman of the Board. 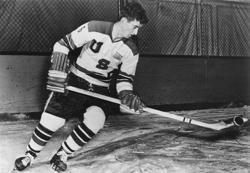 He had taken an active part in hockey and the Blackhawks since his graduation from Brown University in 1950. As president, Bill found himself more and more involved in the daily operations of the game. But Bill’s interest in the game went far beyond the natural concerns for his own team. As Chairman of the National Hockey League Board of Governors, he spent many long hours dealing with hockey problems on the league level. As Chairman, he dealt with such matters as player negotiations, expansion and the myriad of problems that developed on the international hockey front. His fellow owners elected him to nine terms as Chairman over an 18-year period. He also worked tirelessly on the operation of their home ice at Chicago Stadium—improving the facility over his tenure with such additions as air conditioning, new seating, comfort facilities and expanded parking. 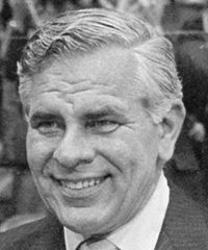 Bill later served as a member of the 1980 and 1984 United States Olympic Ice Hockey Committees. He was also very proud when the Blackhawks signed Ed Olczyk, a 1984 Olympic team member and Chicago native, to a professional contract—making him their first selection in the 1984 entry draft. Along with his father and brother, Michael, Bill was also very active in harness racing both as a breeder and in the racing end of the sport. One of their greatest breeding accomplishments was the development of Governor Skipper, which was named pacer of the year in 1977. Wirtz was also elected to the Hockey Hall of Fame in Toronto as a builder in 1976.